Gmail’s Undo Send feature gives users of Google’s free email service up to 30 seconds to change their mind on a sent email before it leaves their outbox. 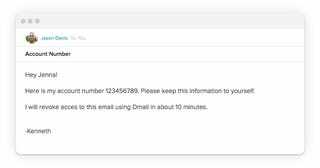 But a new Chrome extension called Dmail lets you send messages with a self-destruct timer—or the ability to remotely delete them whenever you want. If you send an email with Dmail, you have the option to set a pre-defined self-destruct timer on your message—be it an hour, a day, or a week—but if you choose not to, you’re also able to later delete it from the recipient’s inbox whenever you like using a ‘Revoke Email’ button that appears on the sent message. The service works best when both the sender and receiver have the Dmail Chrome extension installed as they’ll be able to see your message right inside Gmail. But if they don’t, they’ll simply get a ‘View Message’ link allowing them to see your email via a web view. It’s an extra step, but it means the service works with whoever your recipients are. And after an email times out, or you choose to manually revoke it, the recipients will then see a message telling them it has been destroyed or no longer exists. Created by the folks behind the Delicious bookmarking service, Dmail uses 256-bit encryption and a system whereby the encrypted message and the decryption key never end up on the Gmail or Dmail servers together. That way, only the sender and receiver are able to read it. For the time being, the Dmail Chrome extension is available as a free beta with no signup required, and no limits on sent or received messages. But its creators do plan to monetize once it’s more officially available. They’ll use a freemium approach so that users will still have the option to use it for free, but with limitations. And come August, an iOS version of Dmail will be available, followed shortly after by an Android version, so you’ll be able to easily access the messages on mobile devices too.